How to Easily Master Format LG G2 MINI D618 & D620 with Safety Hard Reset? Tips and tricks for solving LG G2 MINI D618 & D620 problems. If we are not comfortable using big LCD screen smartphone, then LG also have 4.7 inches LCD screen which fit to our hand and easily save to our pocket, it name LG G2 Mini. The processor use Qualcomm Quad Core 1.2Ghz for fast response and also have 8 megapixel camera for daily capture moment. LG G2 MINI D618 & D620 have 8 GB internal memory with 1GB RAM for multitasking. LG G2 MINI have single SIM card and also available for dual SIM Card GSM & GSM on together for specific type. How to Fix or Problem Solving for Recovery LG G2 MINI D618 & D620 hang or not responding or malfunctions or stuck or freezing or bricked ? We can install many applications at our LG G2 MINI D618 & D620 from Google Play Store, because the performance is good for more than standard daily activity. But we need to know, some applications at Google Play Store are not always compatible with our phone. Some applications also created from un-responsible developer so maybe our phone become trouble after download that applications. The problem at our LG G2 MINI D618 & D620 become hang or stuck or bricks or broken or blank or LCD touch screen not responding or boot loop and something like that. We need to do force soft reset or reboot or restart the LG G2 MINI D618 & D620 to clean up any temporary files or cache that can make our phone become trouble. If the problem still happen, then we should have to do hard reset or master format. Please remember, doing hard reset or master format can make all of our important data become wipe or erased from LG G2 MINI D618 & D620. So, we need to do backup first before performing hard reset. 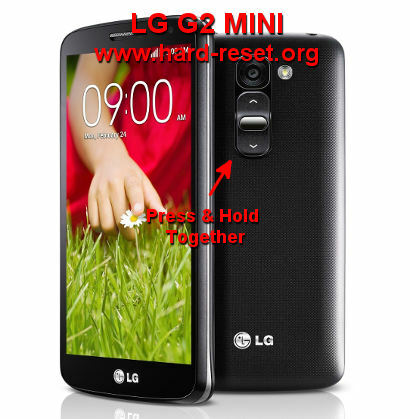 How to Force Soft Reset or Force Reboot or Force Restart LG G2 MINI D618 & D620 ? Doing soft reset or reboot are recommended to do when the phone act not normal, we can try to force soft reset LG G2 MINI D618 & D620 by open the back case and remove the battery for about 5 seconds. Try to put again the battery at the right position and press power button to turn it on. This steps already finish with doing soft reset or reboot. If our LG G2 MINI D618 & D620 still can access at menu or the touch screen still responsive, then we can do routine soft reset or reboot or restart by press and hold POWER button several seconds until the pop-up menu appear, and choose Reboot / Restart to do soft reset. This reboot process is safe to do anytime, because beside it will try to clean up the temporary files and caches at LG G2 MINI D618 & D620, also the important data and applications still keep safely at the memory. The LG G2 MINI D618 & D620 will do the master reset process. The LG G2 MINI D618 & D620 will continue master reset, wait for several minutes until the the phone start like new again. How to Restore and Reinstall Clean Android Operating system / firmware at LG G2 MINI D618 & D620? LG G2 MINI D618 & D620 use Android Kitkat as factory default operating system or firmware. We have to know that the source file of factory default operating system already saved safely inside LG G2 MINI D618 & D620 ROM. When we think that LG G2 MINI D618 & D620 operating system corrupt or damage, then we can reinstall or restore the factory default OS using hard reset or master format steps above. So everyone can do hard reset or master format without need to copy or connect our LG G2 MINI D618 & D620 to other device or gadgets. But please always remember to backup any important data before doing reinstall or restoring the default firmware at our LG G2 MINI D618 & D620. How to Unlock or Fix or Bypass or Solutions for LG G2 MINI D618 & D620 forgot password code or security lock screen pattern or pin (lost password)? It is very recommended to give more security protections at our LG G2 MINI D618 & D620. There are several options that we can choose. LG also have own security protection which call Knock Code from Setting > Display Tab > Lock screen menu. But we also recommended to use screen lock pattern for faster and easy access for any one, but some users also still like to use Password Pin protection. Please remember to give Backup PIN after give the security protection. This Backup PIN have functions to unlock forgotten security protection when we forgot the answer. Basically we also can bypass or unlock forgotten security screen lock pattern or password PIN or Knock Code protection using Google account or Gmail username and password. So, after we try to unlock the forgotten main answer with Backup PIN or we also forget the Backup PIN then we can try to restore using Gmail account that we have already signed in before. Try to give several time wrong answer until the phone freeze for several seconds, at this time we will find Forgot Password / Pattern button, press this button for bypass or unlock using Google account. If we still can not access the Google account, then we have to do hard reset or master format using Hardware Button steps above. How to Improve Performance LG G2 MINI D618 & D620 to make run more faster? We can use LG G2 MINI D618 & D620 to play music, video, doing job, playing games and many activity without problem because it have Quad Core processor and 1GB RAM. But we have to remember all applications need memory to run. If we install or try some applications from Google Play Store, some of them will keep run in the background to wait for command or data update, and all of them also need memory and processor resources when running, this process sometime will make our LG G2 MINI D618 & D620 performance become slowly. Some users does not aware about background process because the application does not give any warning. Therefore, we suggest to uninstall not use applications. If we want to make our LG G2 MINI D618 & D620 performance faster like new, then we have to consider doing hard reset or master format. Is That Any Secret Code for Doing Format LG G2 MINI D618 & D620? There is no secret hidden code for LG G2 MINI D618 & D620 to make it back to factory default. Do the options above to hard reset it. How to Upgrade LG G2 MINI D618 & D620 to Android Lollipop ver.5 ? Until we make this information, LG still not release official update for LG G2 MINI D618 & D620 product. There are some firmware update for LG G2 MINI D618 & D620 but usually only for minor upgrade, not change to Android Lollipop. However, there are some other community which release unofficial Android Lollipop for LG G2 MINI D618 & D620, but we need to follow all non standard steps to install custom rom or root carefully because some wrong steps can make our LG G2 MINI D618 & D620 get trouble and can not use anymore. The information from this page describe about hard reset lg d618,lg d620 hard reset,HARD RESET LG D620,Hard reset d618. If you need another resource for hard reset, use search function at this homepage or find from our related posts. How to Easily Master Format SAMSUNG GALAXY NOTE8 with Safety Hard Reset? How to Easily Master Format LENOVO A PLUS with Safety Hard Reset? How to Easily Master Format LG G FLEX (D955/D958/D959/D950/LS995/F340) with Safety Hard Reset? I couldn’t do the hard reset on my smartphone so I’ve searched on others websites and I realized that in #Option 2 is missing a step. On step 4#, While doing No.3 steps, we will see LG Logo, at this time we can release Power Button (keep press Volume Down Button) and press and keep POWER BUTTON again. After this, you can continue doing the others steps. Hi, thank you for share your information, we have already updated the information above. I accidentally unplugged the cable of my g2 mini from the USB port of PC while updating my firmware or software into lollipop. Now, I can’t open my g2 mini even doing the hard reset you mentioned. Can you help me? Is there any chances to fix it? Thanks. Hi, the stop processing while flashing or upgrade the operating system at your LG G2 Mini can make your phone become bricks. You also have already done hard reset using hardware button, but your phone still can not turn ON. Please consult with LG authorize service center. i have tried option 2 hard reset so many times, when the factory data reset screen appears i select yes and then the next screen i select yes to start and factory reset processing appears for 3 seconds and then goes back to firmware updade locked screen. Hi, usually after choose factory reset at normal standard rom, your LG G2 Mini will start to reformat several seconds and after finish it will reboot automatically and start your LG G2 Mini from beginning. But we are not sure why this problems happen. Maybe you should consult with LG authorize service center for more information.